Marie Sharp's Fiery Hab- 10 Oz. The Marie Sharpes Hot Sauce was awesome. Not just a burn your mouth hot, but a very flavorful sauce with kick! Perfect when just added on directly, or when using for cooking! Perfect blend!! Had such an amazing experience ordering my favorite hot sauces through Mo Hotta Mo Betta! I will without a doubt be back for more. Great prices and fast shipping. Better than ordering from Amazon! I have used Maria Sharp's products for 35+ years and love the products for their simple, flavorable heat! Stores around where I live carry the imitation version, but not the Maria Sharp's so getting them from MoHotta has been a godsend! Very good and wonderful tasting!! I first tasted Marie Sharps in Belize in 1995. I have had it on the shelf ever since. I'm a Chef and the carrot based sauce has Great Flavor and just the right heat. The best hot sauce I ever bought. Flavor is great. hot too. This is my go to sauce for just about everything. The right amount of heat, and great flavor. My favorite hot sauce. I got hooked on Marie Sharps fiery hot while in Guatemala on a mission trip, it has just the right amount of heat and flavor. Very good sauce! Dec 29, 2014 | By Denise O. Love this stuff. Tired it while in Belize, but 6 years later we still purchase it. We put it on everything, eggs, rice, pizza, tacos, ice cream (just kidding), etc. It's a good basic hot sauce. Awesome sauce, but beware the size! Easy 5 stars for the sauce. Nothing beats Marie Sharp's. I've become an instant devotee! I visited Belize 2 years ago and was introduced to this hot sauce by our very knowledgeable tour guide. He recommended it highly and I have not tasted anything better! This hot sauce is a great buy cause you will not need too much...but I find myself using it on food I never used to use hot sauce on; anyway this is some great tasting hot sauce you can count on! The best hot sauce ever! Went to Belize, tried it, and been hooked ever since. Just the right amt. of heat and flavor. Slightly sweet,sour, and salty. If people knew, Texas Pete and Tabasco would be out of business. this really is the best hot sauce ever!!! One of the best HOT sauces I've ever purchased. Especially great on Tacos and any Mexican food I've tried it on! I have been using Marie Sharp's Belizian hot sauce since my first trip to Belize. This stuff has loads of flavor and good heat. There are plenty of hotter sauces out there but the flavor of this stuff keeps me coming back. Just glad to see Mo Hotta carries it. I have had a ton of varieties of hot sauce over the years...but I keep coming back to this one as a fire enhancer w/ versatile usage and incredible flavor. A MUST have. 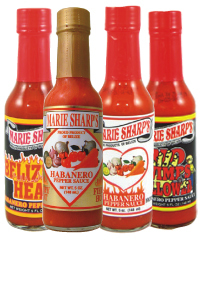 I have been using Marie Sharp's hot sauce since trying it when my husband and I vacationed in Belize 15 years ago. It is hot, but the other ingredients really make it stand out. I use it on everything!! My sister brought a bottle of Fiery Hot back from Belize for me and I've been hooked ever since. If you're tired of the same old hot sauce flavor, the carroty-lime taste of Marie's is the answer. It's mild enough to apply generously to all your favorite foods!